That was not a joke. Forgotten chicken is a real thing and I’m asking you if you seriously remember it. I don’t, but Bjork does. And he mentioned it the other day, how much he ironically remembered and loved and missed having Forgotten Chicken as a kid. There was enough for every meal all week. NO MORE COOKING! I mean, woops. I mostly do like to cook. It forced me to make my own homemade condensed cream of chicken soup, which was easy and wonderful and I’ll do it again, possibly forever. It was so customizable. I could have even added vegetables. Could. Have. It was intensely cozy and comforting. Raw chicken shot? Doin’ it. And now you know how to do the complex step of laying the chicken breasts over the rice mixture and lightly sprinkling them with your favorite seasoning, preferably southwest hickory or chipotle flavored. Like I said, com-plex. One thing to know. This yummy chicken and rice casserole needs to bake for a loooong time. That’s sort of sad if you live in the Philippines, but really happy if you live anywhere else. Except, like, Mexico or something. It’s worth the wait. Go watch TV. Read a book. Put your feet up and dream about making salted maple pecan pie bars again, for the fifth time this month. As in it’s like, December 5th. And if you DO live in the Philippines or Mexico or any other warm-ish place, just turn your fans to Level Three. You’ll soon be lost in a big bowl of this goodness so don’t even worry about it. You’re probably wondering if it’s worth venturing into the hot oven around 00:45:00 to remove the foil, even though your face will start dripping off and you will probably burn your hand? Yes, it is. Oh wait, you guys use real potholders instead of dishtowels? SMART. Anyways, take that foil offa there because the top gets crunchy and browned and crispy when it’s left uncovered. And I’m telling you, I couldn’t love that golden browned crispified top layer more. And then, like a true casserole lover, smother it with cheese or sour cream or something really bad for you. No, it doesn’t have to be bad for you. But actually yes it does, because it’s delicious. I inlcluded the instructions for yesterday’s homemade condensed cream of chicken soup in this recipe, so if you follow these instructions you’ll already be making your own! If you want to use canned cream of chicken soup, there is a note about that in the ingredient list, too. This chicken and rice casserole is frequently requested by my husband who grew up calling it “Forgotten Chicken.” Simple and satisfying! Make the sauce: combine the chicken broth and 1/2 cup of the milk in a large saucepan. Bring to a low boil. Meanwhile, in a small bowl, whisk the flour and seasonings into the milk until a smooth, thick mixture forms. Pour the flour and milk mixture into the saucepan over low heat and stir continuously, whisking as the mixture simmers. Continue to simmer and stir/whisk until the mixture is smooth and thick, 5-10 minutes. Preheat the oven to 375 degrees. Generously butter a 9-inch square baking dish – it really sticks to the sides. In a large bowl, combine the uncooked rice, condensed soup from step 1, 1 tablespoon seasoning, and water. Pour into prepared dish. Arrange chicken pieces over the top and sprinkle with the remaining tablespoon of seasoning. Cover with foil and bake for about 45 minutes. Remove foil; bake for an additional 30-45 minutes or until rice and chicken are cooked through and top is slightly browned. Allow to cool for 15 minutes; shred chicken into small pieces and stir to combine with the rice. Serve with a dollop of sour cream or shredded cheese. A few commenters mentioned their rice not cooking all the way through, so you might want to just add a little extra liquid (about 1/2 cup) and keep the pan covered with foil for the entire baking time. Be aware that covering the dish helps it cook faster, while leaving it uncovered gets that nice browned texture on the chicken. I used a combination of both as mentioned. Add water or milk as you reheat it to bring it bake to its original creaminess. Nutrition information is for 8 servings. Have I made this in the Crockpot yet? Sadly, no. Only 23 times in the oven. But it seems like a very wise thing to do. Have you ever tried freezing this? My sister is having a baby today, and I was thinking of making this to put in their freezer, I’m just not sure the best way to do it. I think I would freeze it after baking (so it already cooked) and add a little more water or broth to the whole thing so it doesn’t get dry. Great recipe! How you you recommend reheating this once it has been frozen? I don’t have a 9-inch pan. Is there something else I can use to bake this? 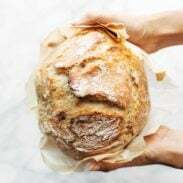 You could use a 9×13, just adjust the baking time so it doesn’t dry out. It will be in a thinner layer so it will bake a little faster. I tried this today, and it turned out great! Okay, I actually changed your recipe a bit based on what I had on hand, but it still worked quite well by following your format. The condensed soup part was mainly all I changed; I used almond milk and ground flax seed instead of milk and flour in my condensed soup, plus I added a bit of butter to thicken it up. I used chicken thigh instead of breasts, and added some finely chopped bell pepper and carrot. I let it cook at 300 for 2 1/2 hours while I was at church,and when I came home, it was perfectly cooked! We ate it with salsa, sour cream, cheese, and chips. Thanks for an awesome base recipe; I will be going back to this one again and again! This is great! If you remember, I am really interested in knowing the measurements of flax and almond milk you used or just your process of making the condensed soup. I tried looking up conversions, but I could not find anything that would help me. Thanks in advance! I tried this last night. For some reason mine had quite a bit (at least a quarter) of undercooked rice and if I would have cooked longer it would have been really dry. Not sure what I did wrong because I even soaked the brown rice for a little while anticipating it might undercook otherwise. Any suggestions? Bummer! If you use the same rice a condensed soup next time, I’d just add extra water. i havent tried this, but you could also try doing it in the rice cooker so that the rice gets fully cooked. 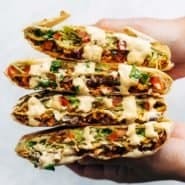 I was wondering if anyone has made this with adding vegetables in it? I’m thinking some broccoli and mushrooms. I am just wondering if I would add them in the mixture at the beginning, or maybe mix them with the rice when I take the foil off? Just not sure….any thoughts or suggestions? I would like to know the same thing, Jamie. I would like to add broccoli but don’t know at point in the process to do so. Hi Patty, I would add it at the end, similar to the way it is added in this recipe. I just thought I would let you know that I found this recipe via pinterest! And this recipe has been a complete pinterest win!! We have made this several times in a few different ways and it has turned out perfect each time. Thank you so much for sharing! My husband and I are working in Zambia, Africa right now, so I’m always on the hunt for recipes without can-of-whatever soup. In the States, this is one of our favorites, so I’m looking forward to indulging tonight (it’s just waiting to go in the oven)! This is the first time I’ve been to your blog (I just Googled “chicken and brown rice casserole”), and I was SO excited to find this recipe with ingredients I have on hand AND to see that you’re from Mpls (your husband’s name is a dead giveaway) AND that you’re working at CSC!!! I’m from MN, and my family is distantly related to Marlys and Paul, and my sister worked as a nurse there for a year in 2003. What a small world! Thanks for the recipe! Do you suppose this would work with quinoa? Yes, but I don’t think it would need to bake as long. I live in Manaus, Brazil. Its hot all the time and unfortunately, I always seem to pick the hottest days to cook something like this in the oven. Very fortunate for us though, I Googled chicken and rice casserole and this came up! Condensed soup is imported and ridiculously expensive, so I was pleasantly surprised to see your homemade version. Delicious! Didn’t have the rice cooking issue, but had to use white rice because that’s what I had on hand. Found this on pinterest and tried making it last night in the crockpot. Unfortunately, 4 hours on high did NOT get the rice all the way done. 🙁 Next time I will start the rice portion (with extra water) in the morning on low and add the chicken in the afternoon, switching up to high when I do so. I used Campbells Healthy Choice Cream of Celery soup and Hidden Valley Garlic Herb mix. I love using cream of celery because it gives a slightly-sweet flavor. No cheese or sour cream needed! I, too, would love to hear the almond milk-flax seed ration as I will be going off dairy in 2014. Good to know! Thanks for the comment! Sorry to hear that Sarah! Cooked rice might be the safest bet for you in the future. I just made this. Yum! My husband ate half the pan! By the way, definitely add another 1/2 cup of water and cook for 20 mins longer to ensure the rice is cooked fully. Hi!! Love your blog!! 🙂 I really want to make this but I only have long grain white rice so would I be using the same amount of water and cook it the same amount of time if I were to use white rice?? I’m sorry if this is a stupid question; I dunno much about cooking!!!! 🙂 Thank you!! Yep! Lots of people comment about the liquid not being enough so err on the side of adding a bit more, or baking longer if necessary. This is a great recipe! I have made a version of this for years, doubled, halved, added veggies, bacon bits and used the home made “cream of” soup mix with great success. Over the years, I have shared it with others and when they have issues with the rice not cooking through, I always ask if they remembered to cover the dish and seal it well with foil, to keep the steam inside. Often, they have not done so, and much of the moisture meant to cook the rice is lost. 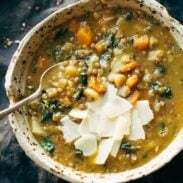 As for the nutrition of this recipe, I think it would be very healthy, particularly using brown rice and homemade soup mix and using added veggies, such as broccoli or peppers. lots of protein, calcium, fiber from the rice and veggies, healthy carbohydrates and little fat if not using canned soup. It’s a winner all around…if you don’t use the bacon, but of course, it’s delicious with bacon! (What isn’t?) Thanks for sharing this favorite! Agreed about the foil! Definitely have to have it covered, otherwise it won’t cook. 🙂 And love your ideas for add-ins! Thanks Pamela! I love that you posted this recipe. I have been looking for a non soup can recipe [email protected]! I tried this last night and it tasted really good…but some of the rice was didn’t soften! I tried to fix it by adding water and putting it back in the oven for a while but it didn’t seem to help. I just used regular brown rice. Not sure why this happened! I followed the recipe step by step. Other than that it was awesome though! I used tex mex for seasoning – it was yummy! 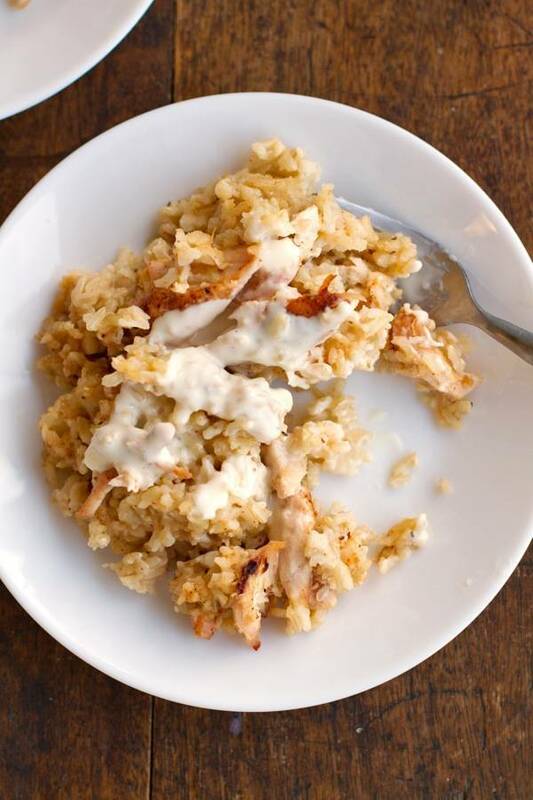 I made this last night and it is so good – exactly the kind of chicken and rice recipe I was looking for. Old school classic comfort food. As the notes suggested, I added and extra 1/2 cup of water. It ended up needing an extra 40 minutes total for the rice to be fully cooked. So, that was a LONG baking time. But, it worked! I now know that if I want it on a weeknight, I should use white rice. Otherwise, a weekend recipe for sure. I’m so happy to have this recipe. It’s SO easy, it’s filling, and you can add any flavors you want it seems. I used Tony Chachere’s seasoning and thought it was great. I might try using cream of celery soup next time just to see bc I like cream of celery in casseroles. And I love that I have enough left over for 1 or 2 lunches to take to work. Thanks for the comment Katie! I appreciate all the feedback because I think it helps others make it work for them. Glad you liked it even after all that baking!